Discovering you have a fly infestation in your home is a common occurrence among householders but that doesn’t mean that we should just put up with it. Swarms of flies around your house is unhygienic and unpleasant so a professional pest control service is the best option to deal with the problem. 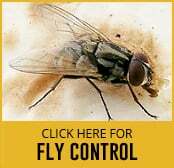 Fly control is available to both private and commercial premises and infestations of any size can be dealt with professionally and efficiently. All fly control methods are completely safe so there will be no harm to any children, wildlife or pets. Wherever you have found an infestation a suitable treatment can be provided, be it in an attic or porch of your home or in an industrial unit or premises serving food. A fly infestation can quickly escalate and affect your business or create unhealthy living conditions so rapid action is required. House-Flies spread disease and leave dirt spots around the home. Cluster-Flies are usually found in the Autumn when they often hibernate in human dwellings. Fruit-Flies are drawn to rotting foods and are a particular hazard when found in food serving premises. Stable-Flies are most commonly found, as would be expected from their name, around horses in stables and farms where they are known to bite humans and animals for their blood. Sewage and Phorid-Flies are attracted to drains, sewage and damp organic waste. Several varieties of fly including Blowflies, Bluebottles, Greenbottles and Flesh-Flies contaminate foodstuffs including meat and lay their eggs which hatch into maggots. Horse-Flies cause extremely painful bites when they feed on blood from humans and animals that they find in the marshy areas that they inhabit. In areas of stagnant water it is common to find Mosquitoes, Gnats and Midges, all of which bite humans and animals. In homes and businesses it is not uncommon to find large infestations of both the cluster and attic fly which choose to hibernate indoors until Spring. They are often found around windows and in roofs and come in five different types which vary in size. If disturbed they are clumsy because of their hibernation and so tend to sit on ceilings, land on surfaces or fly around light fittings. There can be around 100 individuals in a swarm. Sometimes, a fly infestation can point to another pest problem. Bluebottles are attracted to dead rodents or birds in buildings and animal waste draws houseflies. If a premises suffers from blocked drains sewage-flies may appear. Food premises especially must be vigilant for any sign of fly problems in order to comply with food hygiene regulations. Numerous methods of eradication including the use of electric fly killers, fly traps, screens and curtains are effective together with fumigation and insecticides which are useful in some cases.